The intensity of the sound diminished gradually. Her enthusiasm was by now fast diminishing. The delay may well have diminished the impact of their campaign. I don’t want to diminish her achievements, but she did have a lot of help. These memories will not be diminished by time. Her popularity as a singer has diminished since the glory days of the 1980s. The plane strayed into Chinese airspace. Walkers are reminded not to stray from the path. The ship strayed off course during the storm. The children were told to stay together and not to stray. This is the heartwarming moment a baby orangutan hugs its mother after conservationists saved the pair from a potentially ‘deadly’ encounter with local farmers in Indonesia. 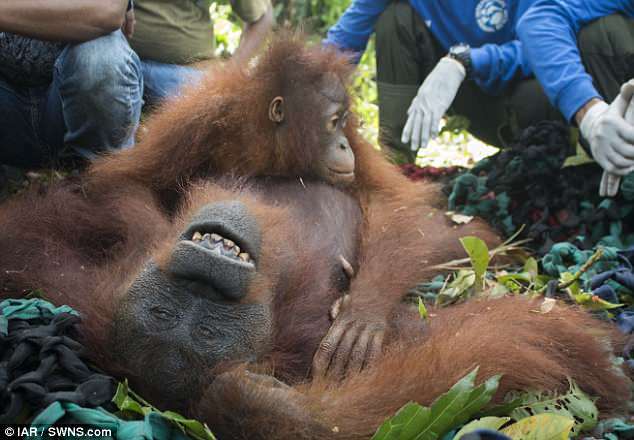 Ris and her baby Riska had been straying dangerously close to a plantation in the Ketapang district of Indonesian Borneo in search for food. Deforestation and devastating fires had destroyed vast swathes of the forest where they were living, forcing them to search for food on farmed lands. Gambling can have a devastating effect on families. If the bomb had exploded in the main shopping area, it would have been devastating. The vast majority of children attend state schools. A vast audience watched the broadcast. The amount of detail the book contains is vast. Huge swathes of rainforest are being cleared for farming and mining. However, this could have cost them their lives, as farmers are known to have killed orangutans who have destroyed crops in the past. Fortunately, a team from International Animal Rescue (IAR) tracked down the mother and child so they could take them back to a safer part of their jungle home. Pictures show the two monkeys in a safety net after being sedated by the rescue team, who can be seen carrying out medical examinations on the animals. With Ris still coming to after the sedation, Riska joyfully hugs its mother and then lies on her belly, seemingly content. I finally managed to track him down in Manchester. He finally managed to track down the papers he wanted. When I saw him after the accident he was still in shock and was heavily sedated. He seems fairly content with (his) life. When I last saw her, she seemed quite content. They’re content to socialize with a very small circle of people. She is content to live quietly by herself. He seems to be content with a fairly minor role in the government. They were content with second hand clothes. 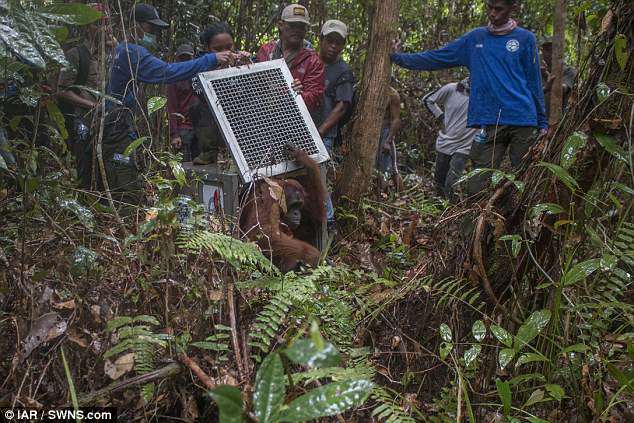 Finding the pair in good health, the conservationists carry the orangutans back to the protected forest of Sentap Kancang. 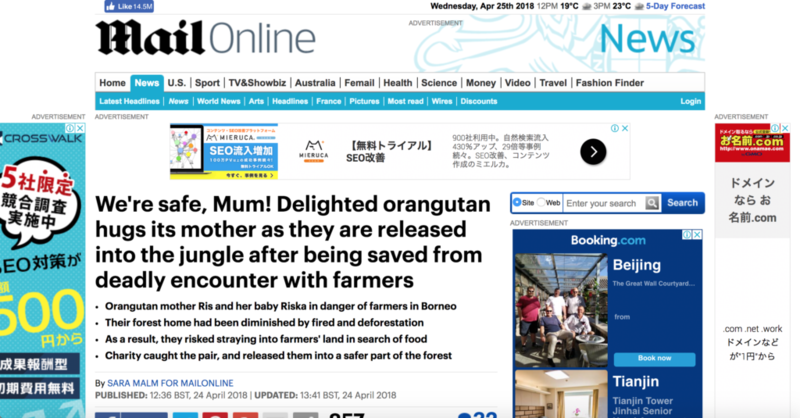 IAR chief executive Alan Knight OBE said: ‘I applaud everyone involved in the successful translocation of this mother and baby out of harm’s way and into a safe, protected forest. According to IAR, visits from orangutans have increased in the area as more land is cleared, particularly since the fires in 2015. They have been applauded for their humanitarian work in Ethiopia. We applaud the family’s decision to remain silent over the issue. We applaud the family’s decision to protect their privacy. Some confusion has arisen as a result of the new system. Did anything interesting arise from the meeting? Are there any matters arising from (= caused by) the last meeting? Problems arise when kids leave school. When the opportunity arose, he decided to take it. The blazes left the forest fragmented, isolating individual orangutans in areas where there isn’t enough food to sustain them. Karmele Llano Sanchez, programme director of IAR Indonesia, said: ‘Degraded and fragmented forests make encounters between humans and people more frequent. ‘This increases the risk of conflict between them. 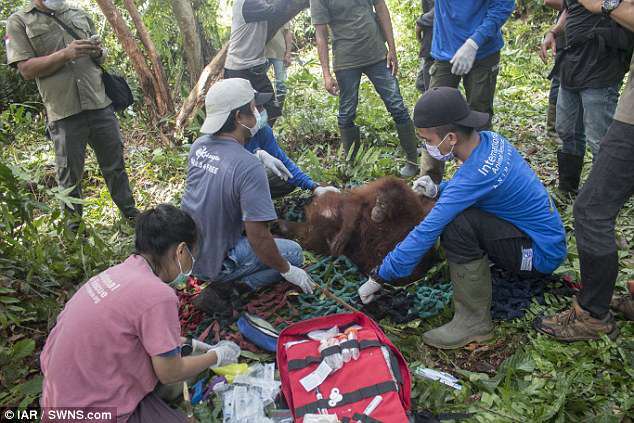 If there is conflict, sadly both humans and orangutans will suffer losses. ‘Regrettably this kind of translocation is only a temporary solution and does not prevent similar cases happening in future. ‘The real solution is to look at how we and all citizens and all stakeholders, including companies and industries, can work together to stop deforestation and land degradation. The satellite will fragment and burn up as it falls through the earth’s atmosphere. We had become a fragmented society during the depression. In this increasingly fragmented society, a sense of community is a thing of the past. He was isolated from all the other prisoners. Important witnesses are isolated from the media for their own safety. A high wall isolated the house from the rest of the village. Every day the environment is further degraded by toxic wastes. The two tribes had lived peacefully side by side for centuries.